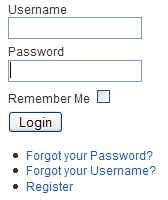 Allows a user to login to the site, as shown below. The Default Login Layout has the following Basic Parameters, as shown below. Show Login Page Title. Hide or Show the Title of this Page. Login Page Title. Title to display as the Page Title. If blank, the Title of the Menu Item will be used. Login Redirection URL. The URL of the Page that the User will be redirected to after a successful login. If blank, the Front Page will be used. Login Description. Hide or Show the Login Description Text, entered below. Login Description Text. 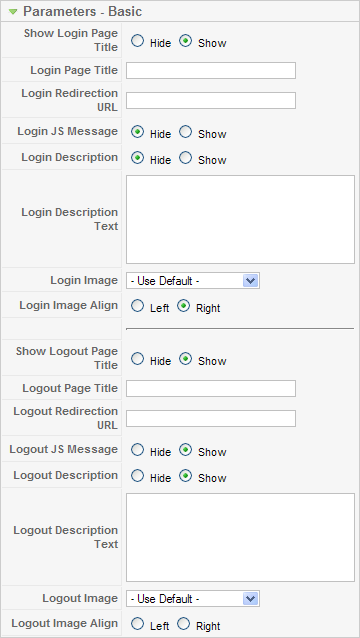 Text to display on a successful login. If blank, the variable "LOGIN_DESCRIPTION" will be used. Login Image. Image for the Login Page. This must be in the "images/stories" folder. Login Image Align. Align image to the left or right of the page. Show Logout Page Title. Hide or Show the Logout Page Title. Logout Page Title. Text to display at the top of the Page. If blank, the Menu Item Title will be used. Logout Redirection URL. The URL of the Page the User will be directed to after a successful logout. If blank, the Front Page will be used. Logout Description. Hide or Show the Logout Description Text, entered below. Logout Description Text. Text to display on a successful logout. If blank, the variable "LOGOUT_DESCRIPTION" will be used. Logout Image. Image for the Logout Page. This must be in the "images/stories" folder. Logout Image Align. Align image to the left or right of the page. This page was last modified on 13 July 2010, at 09:49.